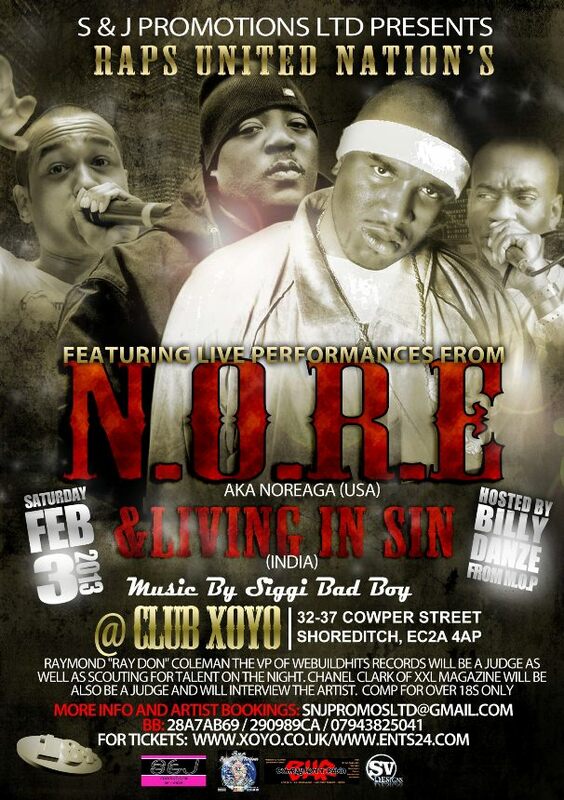 FREE Tickets to watch NORE, Billy Danze and Living In Sin in London! Desihiphop.com is giving away 5 tickets and 2 VIP’s to see NORE perform live in London at XOYO on 3rd Feb 2013 Hosted by Billy Danze from MOP and “That Bombay” Living in Sin. This event is going to be crazy for any Hip Hop fan and is launching the UK Wave of the R.U.N Mix-tape from Raps United Nations. To enter, send your answers to the three questions below to bombayhottradio@gmail.com – closing date for contest is 25th January 2013 and the winner has be be able to get to London or be in London to Enter. Good Luck! 1. what was the name of the Song used in the Event Ad below? 2. What Song did NORE create that coincided with the beef between the west and east coast? For more info, visit their Facebook Event Page! India’s First Ever Graffiti Collective Has Just Launched!